OAKLAND — George Orwell might have called it “Big Brother-ish,” a judge noted Tuesday, but he ruled that evidence from an electronic device that police planted on Yusuf Bey IV’s car can be used in his triple murder trial. Superior Court Judge Thomas Reardon joked with lawyers Tuesday afternoon that Orwell’s novel “1984” about the pervasive government surveillance may have proven prescient, but it still doesn’t stop police from monitoring where people go on public streets. 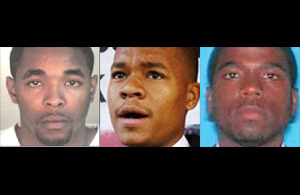 Bey IV and associate Antonie Mackey appeared before Reardon at the Rene C. Davidson Alameda County Courthouse in one of many hearings before the beginning of jury selection in the triple murder case. They are scheduled to return Thursday morning when Reardon will consider a motion to try the defendants separately. Lawyers for Bey IV and Mackey argued that the electronic tracking, for which courts have ruled no warrant is required, violated their clients reasonable expectation of privacy. Data from the device shows Bey IV’s Dodge Charger was parked outside the apartment of journalist Chauncey Bailey less that seven hours before Bailey was killed in 2007. Confessed killer Devaughndre Broussard told a grand jury that he, Mackey and Bey IV were plotting the murder during the 17 minutes they were parked there. Bey IV, the former leader of Your Black Muslim Bakery, is charged with ordering Broussard and Mackey to kill Bailey to stop him from writing about the bakery’s financial troubles in the Oakland Post. In a taped interview with Alameda County District Attorney’s Office investigators the day after Bailey’s killing, Bey IV repeatedly denied going to Bailey’s apartment. Confronted with data from the tracking device, he changed his story and said Broussard just wanted to show him where Bailey lived, according to a recording of the conversation. Bey IV lawyer, Gene Peretti, said people don’t expect police to be crawling around under their cars. Officers installed the tracker in June 2007 when Bey IV was a suspect in a kidnapping and torture case. He was eventually charged in it. “This all comes down to whether a person has an expectation of privacy on the undercarriage of their car,” Peretti said. Mackey’s lawyer, Gary Sirbu, claimed police use of Orwellian surveillance violates Ninth Amendment privacy rights. Reardon said that even if that were so, there was no legal mechanism in place for him to suppress evidence based on Sirbu’s argument. The judge seemed unconvinced on the privacy argument, saying that he saw little difference between a computer-monitored tracking device and a team of police officers following a car clandestinely on public streets. Reach investigative reporter Thomas Peele at tpeele@bayareanewsgroup.com and follow him at Twitter.com/thomas_peele.